No Victorian gentleman would be caught dead without their hat! The type of hat they wore usually depended on where they lived, which in the United Kingdom and American East Coast was probably a bowler. It has since become the trademark symbol of a true dapper English gent, and, believe it or not, was also pretty popular in the Wild West. If you think about it, a cowboy hat is basically just a bigger bowler with a wider brim. Who says cowboys can't look classy? These days, bowlers may not be the big fashion accessories they once were, but they can still add some very dashing style to your ensemble. 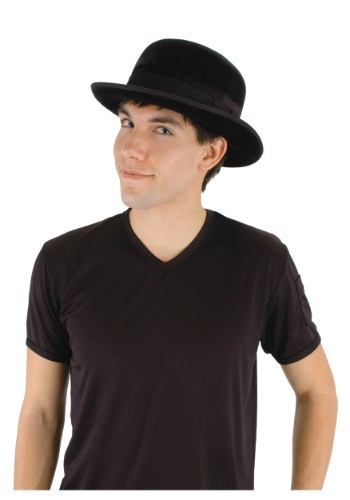 Next time you are dressing up for a fancy party, try this Black Velour Bowler Hat on for size. It would look very proper with a black suit and tie. Or, if you're feeling like experimenting with new styles, see if you can pull off this bowler hat look with your every day outfits!